This Halloween Grinch (is that a thing?) has gotten a lot of air time from news outlets desperate for a new angle now that the old razor-blade-in-the-apple scare has been pretty much shown to be an urban legend. Even among those who think she's a meanie, some feel that she is "sending the right message" about the health dangers of excess candy, given that about one in three American children are overweight or obese. It's not at all clear that fat shaming helps people lose weight. One study found that overweight people who felt subjected to weight discrimination in employment and other settings were more likely to become obese than those who didn't. Massachusetts schools no longer send home letters informing parents that their kids are overweight because these letters didn't help the children get healthier and may have contributed to bullying. Research supports what most of us know from our own experience: positive feedback is more motivating than negative feedback. From whom did you learn more: the teacher whose praise you wanted to earn or the one whose criticism you hoped to avoid? 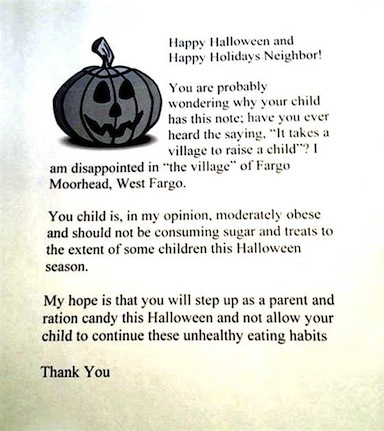 So, lady in North Dakota: hand out money for UNICEF to all the kids if you disapprove of candy. And super-buff lady with three little kids: get back to me when they're teenagers. I'll save you some Snickers.